The temperature is warming up and time for some warm weather gear. My all time favorite warm weather gear is linen and sheer fabric or cotton/poly blend with a lightweight knit.... easy, breezy and effortless. First item on my warm weather gear list is New Look 6351 which I started sewing early and posted about here & here. 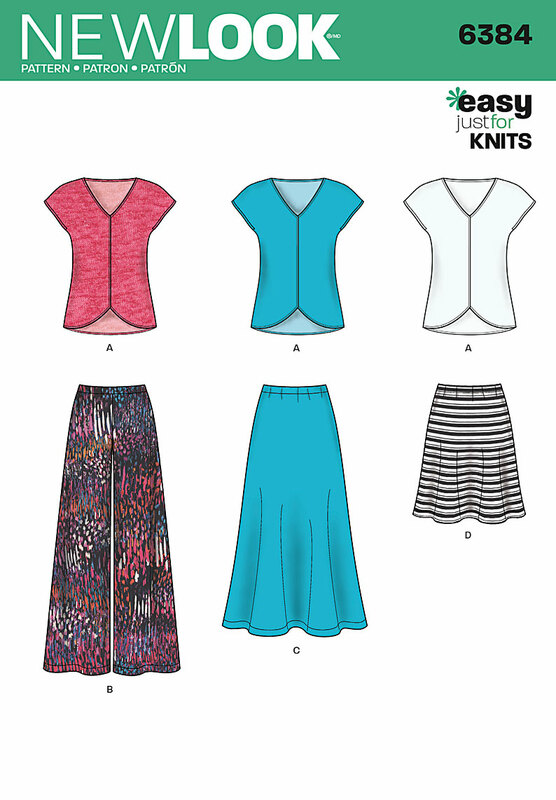 This pant pattern is everything... love the style line, fit and easy sewing. To add some eclectic ummh to my warm weather gear, I picked up this cotton/poly blend purple/creme plaid from Fulton Fabrics. I have been on a plaid roller coaster and wanted to continue it into spring/summer, using lighter fabrics and brighter colors. For this rendition I widen the leg starting from the knee down 3/8". Since the plaid is large, matching was easy. No lining for these, lining can add a combustion factor and didn't want that. I paired the pant with a sheer purple top using Simplicity 1106. Every summer I am in search for the perfect top and tried this one. Mmmm not so sure and will give the other version a try. The cut-out back grabbed me and decided to give it a try. Sewed it straight out of the envelope, and went together easily, but will say it runs big. I cut a large for the body and medium for the shoulders and neckline. I could've gone down a size. The instructions calls for facings........ blech.. 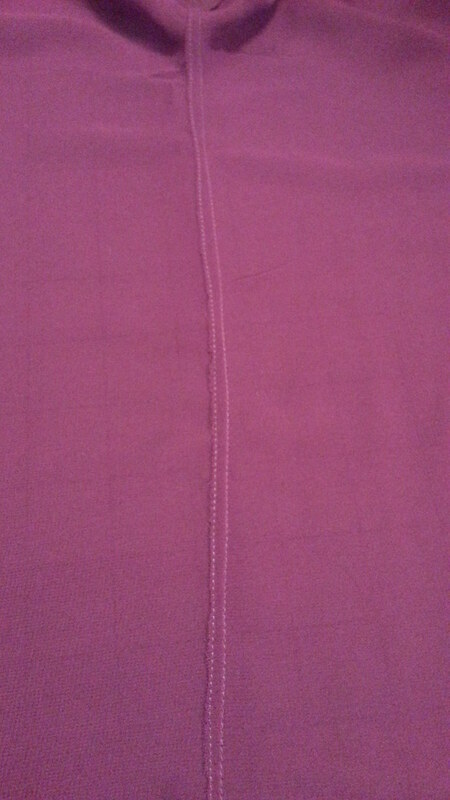 I opted out of it and folded to the inside, stitched, then top stitched the seam allowance and trimmed them. 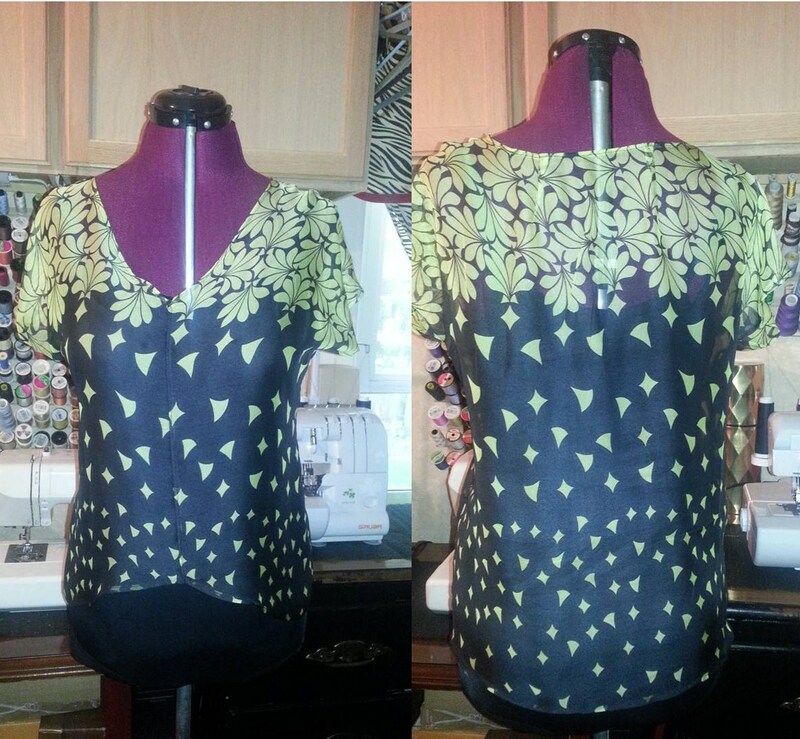 For the neckline, sleeve hems and bottom hem, used stitch witchery and final stitched. I panicked after taking pics of the top and noticed stains. There were grease stains on the front and back of the top.... wth!!! Totally pissed. While chatting with my sewing buddy Andrea and lamenting about my travesty, and all that I did to right my greasy wrong she suggested I try baby powder. I know baby powder is good for grease stains, but thought it only worked if it was a fresh stain. Well, after staring at it for 2 days, I decided to give it a try. OMgee... it worked.......... Thank You Andrea. Moving right along with my warm weather gear, again made another New Look 6351 using cotton/poly blend in a baby soft grey. Paired the pant with New Look 6384. Me love a shaped hemline and swooped this pattern up during one of my walmart excursions. Talk about beyond easy. Used a lightweight striped knit. Sewed it straight from the envelope cutting a large. However, again I was faced with a too big garment, I removed 3/8" from the side seams and shoulder seams and it worked out. Not only do I love the shaped hemline, but the center front seams give one opportunities. I used 1/4" bias trim for the center front for a lil ummph. Thinking this top will be my summer top love. Loving my warm weather garments. Of course, I have several pieces from last year, but needed a few new pieces. Speaking of which, I am in the process of finishing this top to pair with another NL 6351 that I made a few weeks ago in a stretch denim. New York is warm and humid and the purple ensemble was perfect, but back inside I go... I can only take the heat for so long... dabbing at forehead sweat...uggh. I love all of your outfits, especially the light purple set. I have both of those patterns and now I can't wait to make them for myself. I actually went out and purchased the pants pattern because of your previous posting. Great job! You did an awesome job, my favorite is the purple plaid pant and top. These are really fantastic and stylish! I could see these being worn on a casual Friday. Wow you are really sewing up a storm!! Wow. You've been busy. Great additions to your wardrobe. Great outfits! Can't wait to see what else you make with these patterns. Thank you Enuf Already. Hoping you enjoy the patterns as much as I do. Thank you Freshlysewn. They are perfect for casual Friday. All of these are nice. That floral print is my favorite. Thank you Andrea. I couldn't wait to cut into the floral fabric. It was a tedious sew and call that fabric phanthom sheer. The most sheerest fabric that I have sewn to date. Oh I'm loving ALL these pieces and you wear them so well! Love all your new pieces Sheila! Love the sheer top, and the color! Thank you Candice. I am really loving the floral top the best too. Love that purple top, and those pants fit great! I'm so jealous of how productive you are! I love all of these! 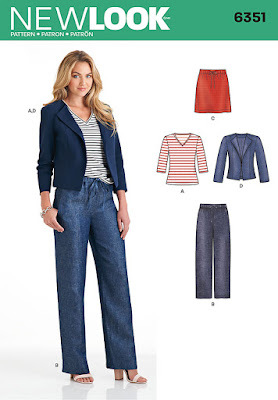 I have the NL 6351 pattern, bought it for the v-neck top and jacket , but I love the modifications you made to the pants. Thank you Levone. I plan to sew the other pieces as well too. Hoping the other pieces sew up as well as the pant. Everything is beautiful and you've chosen some interesting colors. You're moving along with warm weather clothing. Love both looks but that purple number is fantabulous! I love all the pieces you made! I really like the purple top in particular. Thanks for tip about sizing for it. Some very nice pieces you have created for yourself Ms. Sheila! You must havve 3 closets full of beautiful clothing! Thank you Myra. 3 closets... no way. You would be surprised how small my closet is. Loving the shaped hem on the NL shirt! I had no idea that baby powder could get out grease stains! Thanks (to you and Andrea) for the tip! What a great summer wardrobe. Perfect! Love the purple! Such a happy outfit! You are such a talented person. I wonder how you manage all these. I could not even handle stress for having troubles in pregnancy. Though this perfectly planning for a baby had my back.